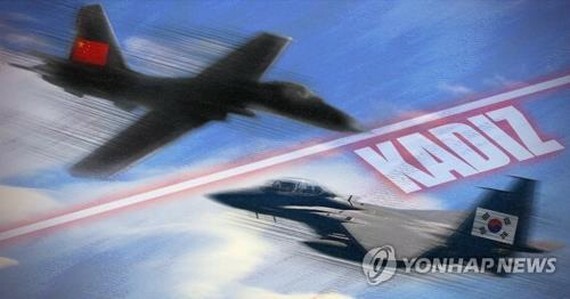 A Chinese military jet entered South Korea's air defense zone Thursday without notice, prompting South Korea's Air Force to scramble fighter jets in response, defense authorities here said. The aircraft entered the country's air defense identification zone, called KADIZ, at around 10:21 a.m. from an area near Jeju Island and Ieo Island and exited it half an hour later, according to the Joint Chiefs of Staff (JCS). It again crossed into the KADIZ at around 11:54 a.m. and flew along South Korea's east cost before leaving the airspace at around 3 p.m., the JCS added. The Air Force deployed fighter jets to track the aircraft and sent a warning message in a "normal tactical" measure, he said. A Chinese military plane also entered the area a month earlier. South Korea's military officials say China's move is aimed at testing responses by Seoul and Tokyo. An air defense identification zone, or ADIZ, is an area of the skies declared by a state for the early identification and location of foreign planes approaching its territory. It is not defined in any international law or treaty. A Chinese military jet entered South Korea's air defense zone Thursday without notice prompting South Korea's Air Force to scramble fighter jets in response defense authorities here said.